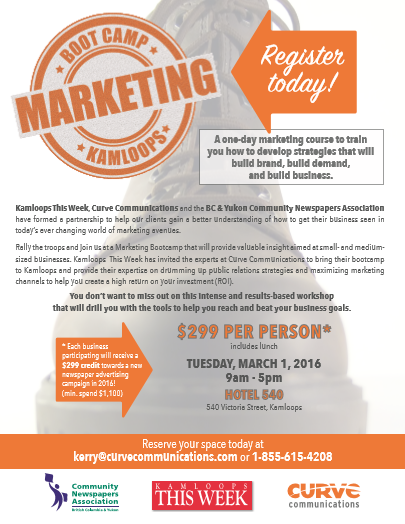 Kamloops This Week is hosting a one day Marketing Bootcamp. If you&apos;re not sure about marketing and branding your business or product; or want a refresher, have a look at this program. It doesn&apos;t just cover print mediums; it teaches on best practices for TV, print, radio, outdoor, direct mail and social media. An attractive part of this program is that your registration fee can be put towards future advertising with Kamloops This Week. We&apos;re always looking for ways to help you to grow your business and increase your market share. Knowing how to manage your marketing and branding is a key part of that and we want to make sure you&apos;re aware of this opportunity for learning.